With an almost completely new set of musicians behind him, consisting of 3 guys from German heavy metal unit Primal Fear's current lineup as well as Frontiers employee Alessandro Del Vecchio on keyboards and in the producer's chair, Norway's probably most recognized hard rock/heavy metal singer puts out yet another record under the anglified moniker of his first name. Even if Lande's style and characteristic voice make it melody-wise sound similar to his recent work sometimes, I find this record somewhat different since he has decided to back down a little bit on the classic hard rock that's been one of his personal key points for quite some time now. Some songs absolutely follow that vein still and the Hammond organ gets its space here and there over the record, but on a level far more modest than before and that does the trick for me I guess. Does Jorn put out something of real value this time? Yes, I think he does, even if it took me quite a few times of listening to the album from start to finish to realize it. The music feels reinvigorated and although he has performed better vocally before, he still proves that he holds a vocal capacity superior than most metal singers anyway. 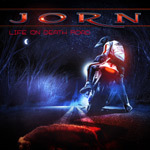 Life On Death Road is his best work in years and if you had given up on this guy after the last couple of records, then now you surely have an opportunity to rejoin the fanbase, no questions asked.